– First off, he’s a bit of a hound-dog. His aspiration is Serial Romantic (dammit, it could so easily have been Soulmate…) and ‘Cheesi isn’t his only girlfriend. 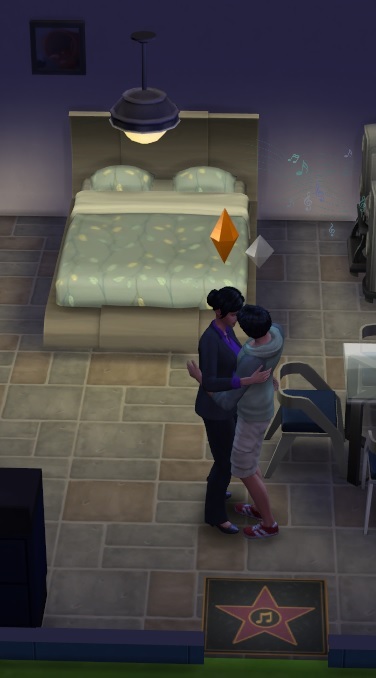 I did wonder when her first woohoo definitely wasn’t his first (the game tells you). – Secondly, he’s an adult with only 3 days to go before Elder status and the sudden loss of the ability to procreate. Argh! But he looks so young! Oh well, good genes — if she can get ’em. Great genes, in fact, as they have a lot in common: they’re both Good and Creative, and he’s Active to boot (which may explain his youthful looks, come to think of it). Plus he has a level 8 mixology skill, which is pretty bitchin! I can’t change his aspiration because it’s against the rules, so Parcheesi will have to keep a close eye on her husband. Oh wait, she’ll have to propose and get married before he even becomes her husband, and THEN work on getting pregnant as quickly as possible. Note that the rules don’t specifically state that parents have to be married, but they’re called ‘spouses’ throughout and there seems to be an assumption of wedlock, so I’ll follow it. At least she invited him to move in and he accepted, so things can move rapidly now. Parcheesi remains driven to reach the pinnacle of her profession. She’s at level 7 of her Entertainer career; the promotions have slowed down a little now that the criteria have become a more difficult to achieve, but she anticipates getting promoted in the next few days. She *didn’t* anticipate having to get pregnant before becoming a musical icon, but I’ve decided that it’s a provision of Great-Aunt Solitaire’s will; I think it might be illegal to direct one’s heirs’ lives beyond the immediately inheriting generation, but laws are different in Simlandia. I don’t think she cares much about her surroundings, though apparently she prefers modern decor, which means I can’t purchase the decent stove that’s currently available to her budget because it looks old-fashioned and she just wouldn’t like that in her home. So, while I wait to be able to afford the near-$4000 stove, Parcheesi is subsisting on (rather excellent) garden salads. It seems to be preserving her waistline, so that’s not a bad thing – unlike some of my other recent Sims, she’s not having to spend a day at the gym every week. I’m not sure yet whether Gordon will remain an appendage or be more fleshed out, but his personality seems to be emerging whether I want it to or not. He fancies himself a bit of a Clark Gable, but Parcheesi *is* his only soulmate so perhaps he’ll be content to flirt and not act. I also have a suspicion he would love to be a stay-at-home dad, especially since it’s a bit late in life to start a career. Hell, with the money he’s bringing in, maybe he already *had* a career as a bartender and he’s living off his savings. I suspect he’s a generous enough spirit (he is Good, after all) to be perfectly happy to support his wife’s ambition. Insanity. You are like a walking advert for this game. I enjoyed Sims 1 but I haven’t even glanced at the series since then. But you’ve managed to get me interested. Eh, it might be one of those games that’s better enjoyed vicariously if you feel no desire to play it and have no family member to pretend to buy it for. I love those character names and the deep storylines you have going for them.